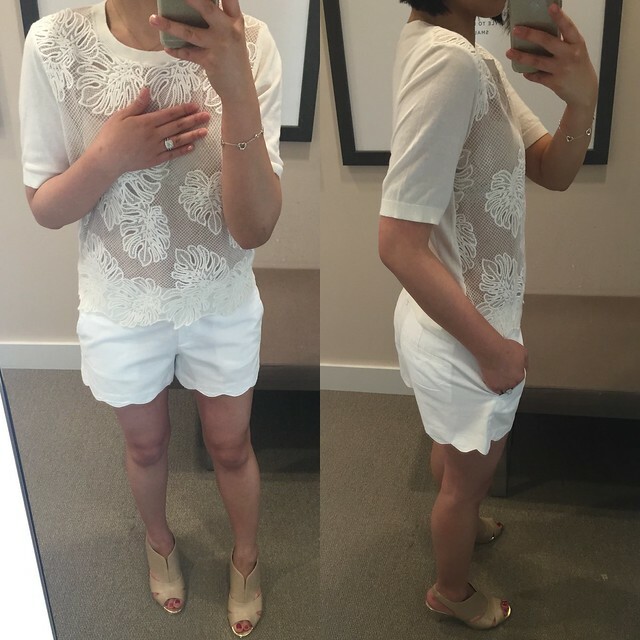 Summer is in full swing and I just wanted to share a few of my work outfits from this week. I work in a laid back office environment so I can pretty much wear whatever I want except ripped jeans, shorts and overly revealing/low-cut clothing. LOFT – Get 40% off select full-price styles and extra 50% off sale styles. Also, select cardigans are now $18. Valid in stores and online. Since no code is needed use the stackable code INSIDER538 online for an additional 25% off full-price purchases of $100+ (I noticed it also works on Lou & Grey). That’s 55% off select full-price styles after discounts! Also, redeem your cash cards to save $25 on every $50 you spend on full-price styles through 6/14. Note: Call customer service and place a phone in order to use multiple cash cards. I don’t think they’ll let you use the stackable code since it’s one code per order though but it wouldn’t hurt to ask. Ann Taylor – Get 40% off your entire purchase with code WEEKEND40. Sale ends 6/15 3AM ET. 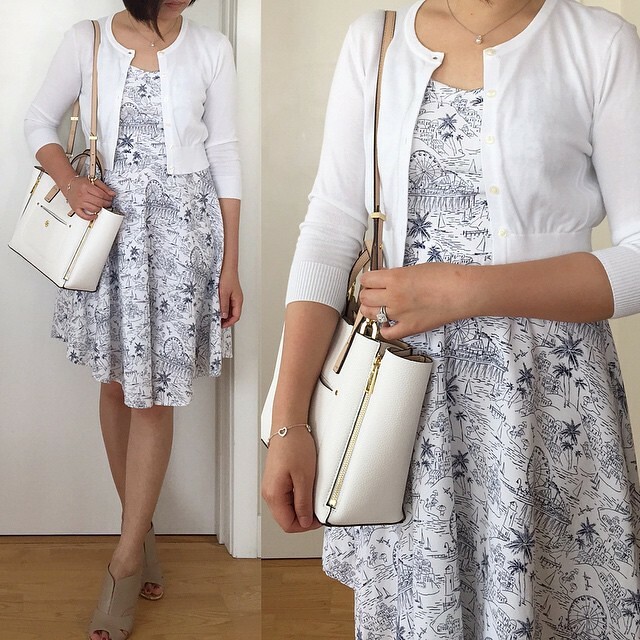 My top picks include this mini pebbled signature tote (review here), graphic lace tee (review here), this clipdot pleated shirt dress (review here) and this classic collarless tipped jacket I reviewed in 0P in my previous post and in size 2P in here. 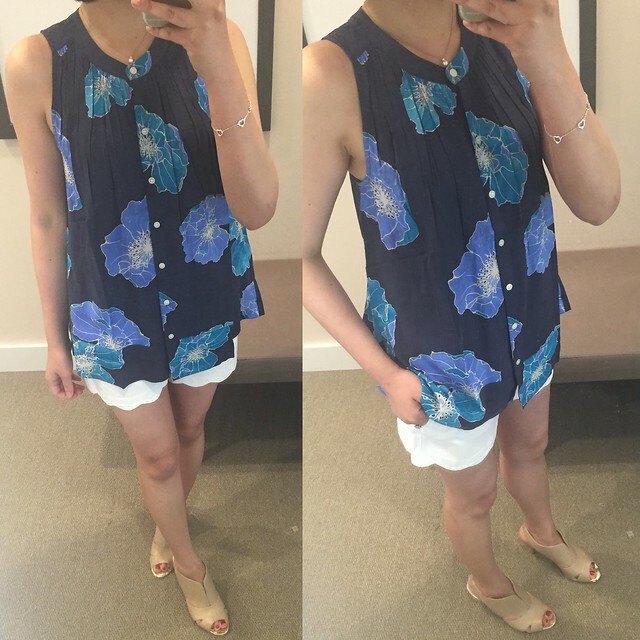 Also, how cute is this printed romper? I went to LOFT yesterday after work since I wanted to redeem my cash cards before they expired. I ended up getting this denim jacket in the western moon wash in size XXSP since it was very flattering. Since I took size XXSP I’d say this jacket runs about one size bigger since I’m usually XS/0P at LOFT. I love this newest wash because it’s neither too light like the one I got last year (as seen in this post) nor too dark. I also have a denim jacket from J.Crew that’s a bit too tight in the arms on me. I’m actually in the process of doing a closet clean out and if there’s anything left over after selling privately to my Poshmark friends then I’ll update my account. fluid tee (review here). 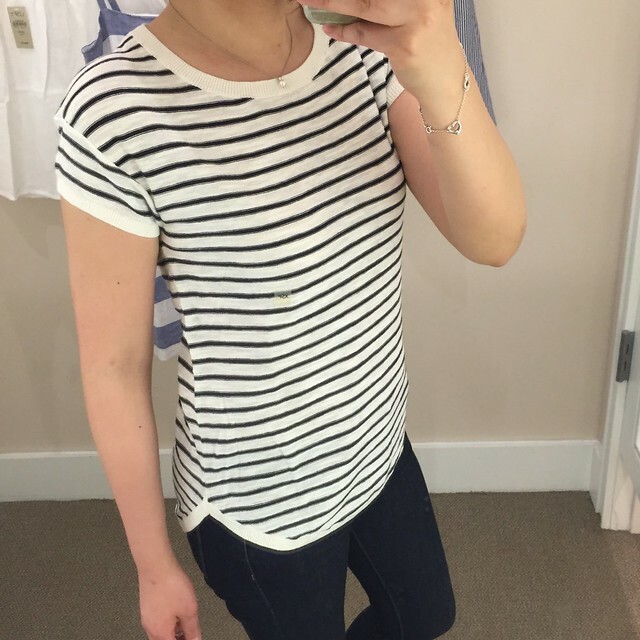 I’d say this top fits true to size and it’s not very boxy unlike some of their petite tops. 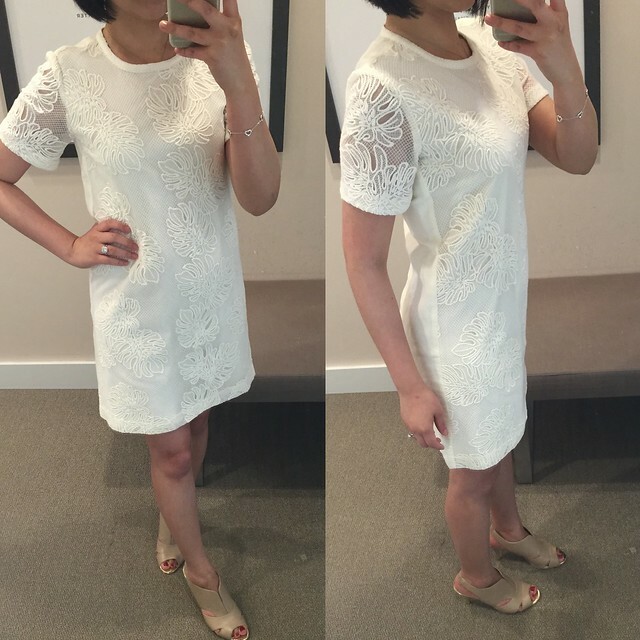 The lace details on the hem and sleeves are the perfect feminine touch. 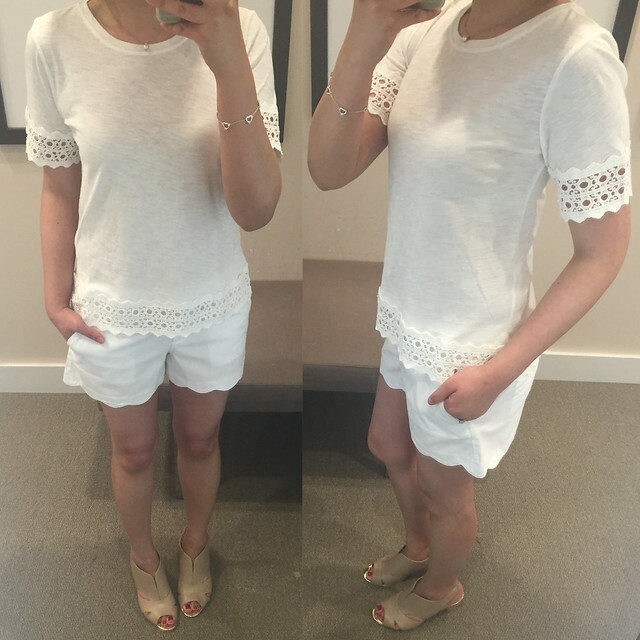 I also repurchased these scallop riviera shorts in size 0 regular since size 00 regular was much too tight on me and I found that this particular pair runs small. I’ll hold onto both sizes for now since my weight and waistline can fluctuate quite a bit. 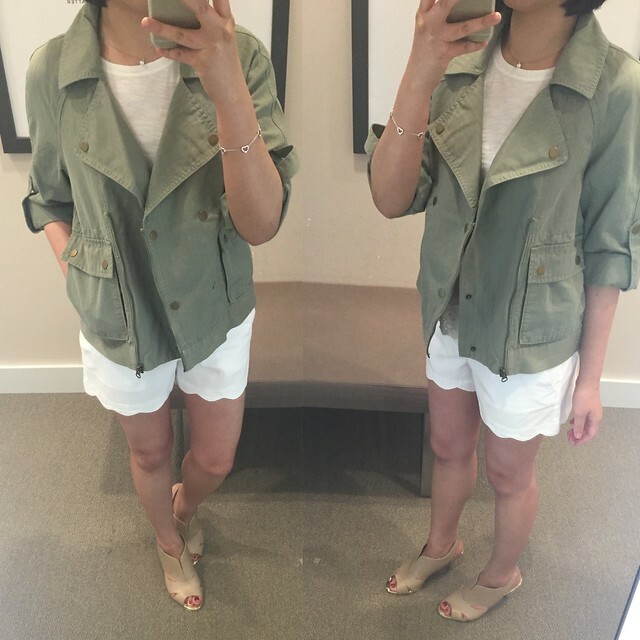 I tried on this drapey cargo jacket in light matcha green in size XS regular because I was curious how the cotton version of the jacket would drape in comparison to the tencel version (currently on sale for $41.99 after discounts). I reviewed the black tencel version here and here. I like that the cotton fabric makes it a much warmer layering jacket than the thin tencel material and I have size XXSP on my wishlist. Size XS regular is actually a bit oversized on me despite the pictures shown above but I’d say this jacket runs true to size to one size larger depending on how you’d prefer it to fit and drape. I don’t need another jacket but I have a weakness for cute outerwear. My wishlist is constantly changing based on what I see and try on anyway. I tried on this pretty floral swing shell in XS regular because my friend Loan was eying it and the large floral print looks very pretty in real life. I was doubtful regular missy would fit me at all but it actually fit me decently. The arm holes while a little large, fit better than the gingham gamine dress I tried on below (also in XS regular) since it covers my bra. I think XXS regular would be the best fit on me while maintaining the longer flowy length. 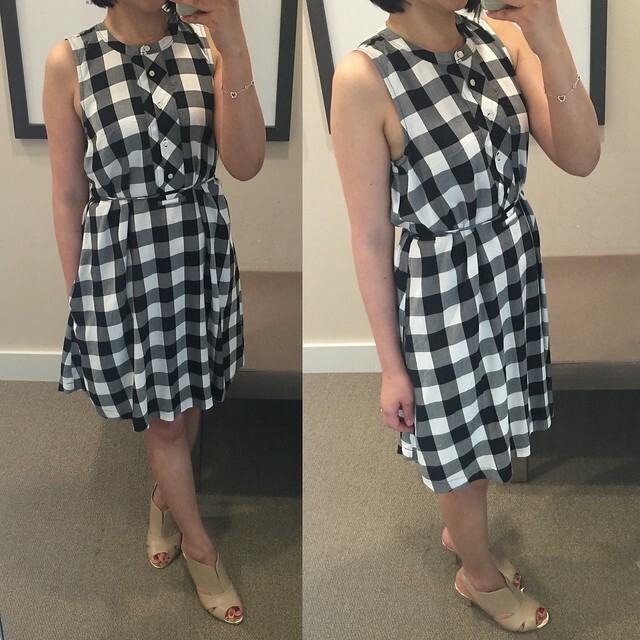 I first saw this gingham gamine dress in the LOFT catalog and I was realy excited about this new arrival. I’m happy to find that this dress drapes really well and it looks good belted but I was late to grab this on-trend piece so the petite sizes were completely sold out. The sales associate at my local store kindly ordered XXS regular for me and I’m hoping the arm holes will fit much better. Size XS regular’s arm holes are really big as seen in this video I saved from my Snapchat (username: whatjesswore). 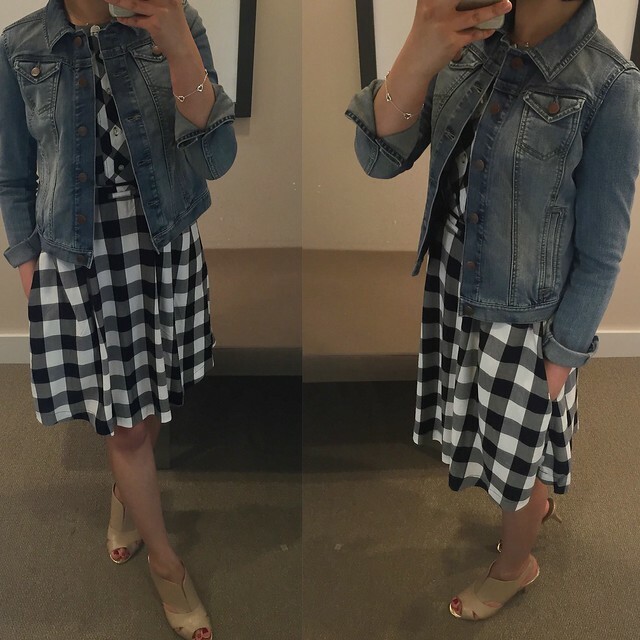 I couldn’t resist trying on the denim jacket with the gingham gamine dress since I saw this outfit featured on Syracuse Stylist’s Instagram account just the other day. 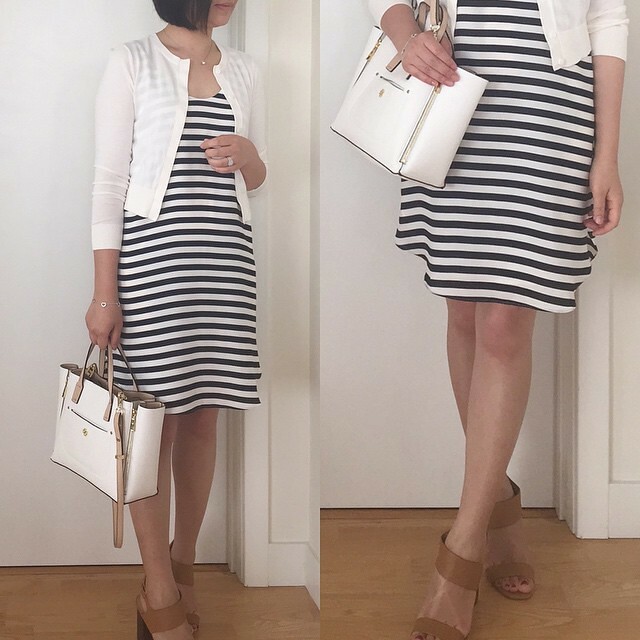 I’ve been regretting my choice to return this stitched palm dress (review here) so I was excited when I found size XXS regular at my local store. I actually think it may be my return from a few weeks ago. I tried it on again and while it looks really cute standing up I did the sitting test and it’s much too short for my personal comfort when I sat down. Perverts can totally peek up your skirt and see your underwear especially if you’re not the type to cross your legs when sitting down. I also found this stitched palm sweater in the sale section and tried it on out of curiosity since I recalled that it received positive online reviews. It’s really cute but sheer in the front and back and I think a layering cami would ruin the look. It would be a cute swim suit coverup. Size XXS regular fit me perfectly so I’d say this top fits true to size. 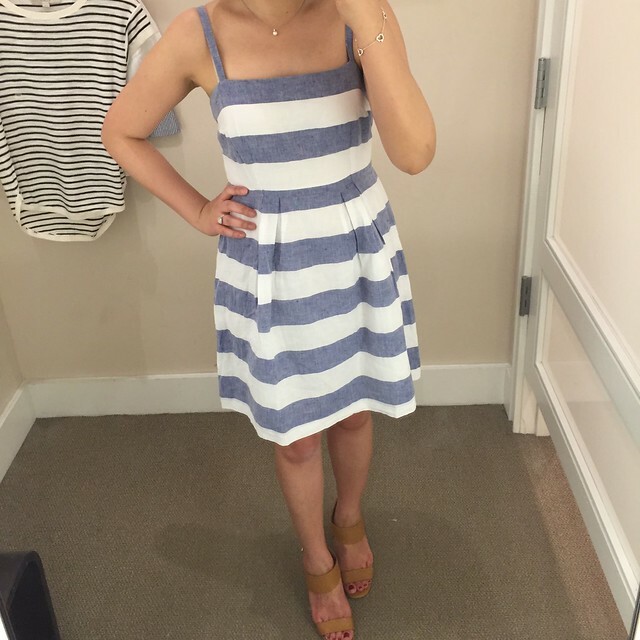 Lastly, I decided to try on this white and chambray striped pleated skirt dress in 0 regular. Unlike last year’s version which I own in pink (as seen here and review here) this year’s version runs about 1-2 sizes bigger. Size 0 regular fits like size 2 or 4 so I would suggest sizing down. I’m pretty much trying to hold the dress up in the LEFT picture above since it looks very unfortunate on me. Update 6/12: I went to my local LOFT after work today to do a return and I was looking for the fluid tee again but there were no more in the mint color in petites. 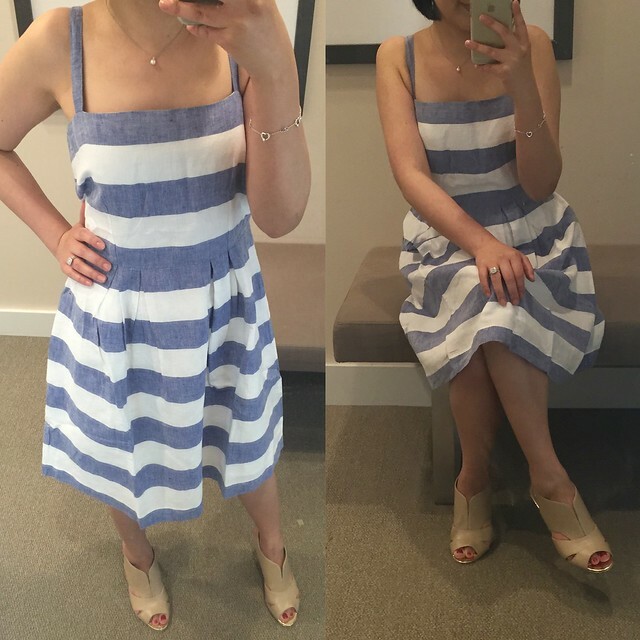 I tried on this striped pleated skirt dress in 00P which fit me pretty well. This just further confirms that this dress runs at least one size bigger for those that are concerned about the sizing. I also tried on this cute slubbed sweater tee in XSP which I saw on one of my coworkers and it fit me really well. I’d say this tee runs true to size and it looks really cute in all three color options.